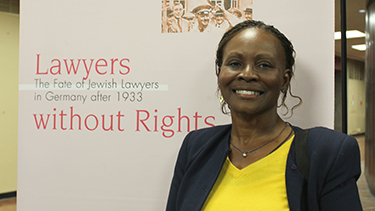 Regents Professor Sherri Burr gave a presentation at the launch of the Lawyers Without Rights exhibit at the UNM Law School on February 7. Close to 200 people attended the launch of the highly acclaimed international exhibit, “Lawyers Without Rights: Jewish Lawyers in Germany under the Third Reich” at the law school on Tuesday, February 7, 2017. The exhibit consists of a series of panels showing the fate of Jewish judges and lawyers in Nazi Germany. While a sizable group emigrated, others went into hiding, ended up in jail, or worked in concentration camps. 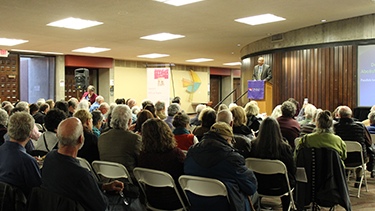 UNM Law School Dean Alfred Mathewson greeted the crowd of close to 200 people attending the event. Burr said the ongoing tendency of those who seize power with evil intent to define groups as other, target them, and systematically reduce or eliminate their legal and human rights. She advocated for studying what happened to other groups in order to avoid making the same mistakes now and into the future. Burr’s engaging, thoughtful presentation was followed by a lively Q&A session. 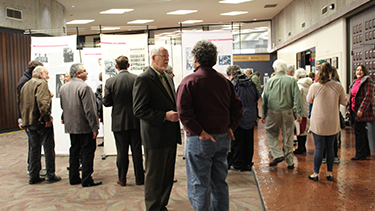 This showing of the exhibit is sponsored by UNM School of Law and the Holocaust and Intolerance Museum of New Mexico in conjunction with the American Bar Association and German Federal Bar. The reception was sponsored by Aleli and Brian Colón. 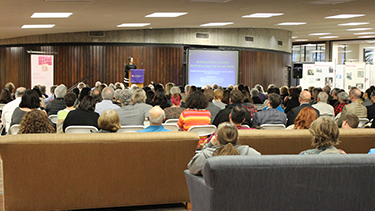 Dr. Kathy Powers, who received a research fellowship from the United States Holocaust Memorial Museum, introduced Prof. Burr. “Lawyers Without Rights” has been shown in nearly 100 cities in Germany, the United States and others parts of the world and will be available for viewing at the UNM Law School through March 11, 2017. For UNM Law School building hours of operation and parking, see http://lawschool.unm.edu/about/building-hours.php. 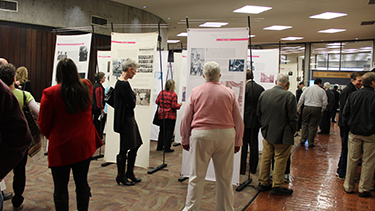 Attendees viewed the exhibit at the law school, which is sponsored by the American Bar Association, the German Federal Bar, the Holocaust and Intolerance Museum of New Mexico and the UNM Law School. UNM Law School alumnus Brian Colón and his wife Aleli sponsored the reception.